A couple of weeks ago I ordered my first ever Glamour 'beauty box' featured in their magazines. For only £14.95 Glamour promise you will make a saving of over £30.00 with what fills the contents of your own box. 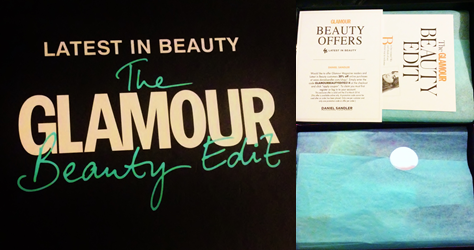 Here are a few pictures of this edition of Glamour's beauty box and what came along with it. As you can see the items come in a lovely understated boxed packaging each one appears to be hand packed with care given the crepe paper wrapping and the straw covering underneath. This box could easily be reused as a make up box and would look super stylish on your dressing table. According to it's descriptor, this liner was made specifically for Glamour and has a strikingly turquoise appearance when worn. I look forward to experimenting with this liner as blues, greens and browns tend to match my skin tone quite well. This is a product I have tried previous to buying the beauty box and was sort of a deal breaker purhcase, at least I knew there was going to be one thing I was sure to love. I love big hair and back combing, so this mousse really contributes to the look I tend to go for. I have heard quite a lot of hype surrounding this lip balm in magazines and blogs alike. I very often struggle with lip based purchases as my lips tend to become incredibly dry I have been on the hunt for a conditioning balm that can save the day and perhaps I have found it? Such use of alliteration, what can go wrong?! With the promise of 'Miss Manga' lashes, I was bound to purchase this mascara eventually, I am a sucker for mascara products and hype. My favourite staple for my eyelashes has simple been false eyelashes and I'd love to finally ditch the glue and move onto a simple mascara! 5. Rituals Zensation Organic Rice Milk & Cherry Blossom Foaming Shower Gel SensationDescribed by Glamour Magazine as 'non gloopy' I don't really have much to go on with this gel, I'm not really one to buy into hype around shower products I'm afraid I'm generally a simple Imperial Leather lady, but never say never! It's coral pink, it's nail polish. Need I say more. With the appearance of a 1990's phone cord, the fabulous invisibobble allows you to tie up your hair and take it down kink free! I'm so looking forward to trying this out especially since for my job I am required to have my hair up for the whole day! Sad as this may sound I am most excited about using the Invisibobble, I want kink free hair so bad!! Stay tuned for the in depth invisibobble review! I currently have Glossy Box but Glamour looks worth the money!